Hudda Ibrahim, MA, is a faculty member at St. Cloud Technical and Community College, where she teaches diversity and social justice. Hudda specializes in international peace studies, conflict resolution, policy analysis, and political change. She sits on several nonprofit boards, including the Central Minnesota Community Empowerment Organization, United Way of Saint Cloud, Minnesota, and the Saint Cloud Area Chamber of Commerce, in which she is diversity council vice chair. She has published articles on reconciliation, mediation, the role of Somali traditional elders, and the use of customary law in Somalia. She has contributed articles to the Huffington Post and other news sources, both local and international. Hudda’s interests include conflict transformation, the politics of reconciliation, global politics, transitional justice, gender issues, and war and peace. She has given talks on issues of community relationship building, peace, human rights, women’s empowerment and inclusion in politics, and alternative world futures at colleges, universities, churches, and other venues. She has written three other books: The Traveler: True Grit , a memoir about her work, contributions, and life journey; Get in the Driving Seat of Your Own Life: Steps to Unleash Women’s Confidence, a book that encourages girls and women to pursue their God-given potential and understand their abilities in order to flourish and be successful in the United States; Gender and Sexuality: Static or Fluid? and The Role of the Traditional Somali Model in Peacemaking, based on her MA thesis. She holds a master’s degree in peace studies from the University of Notre Dame and a bachelor’s degree in peace and conflict studies and English literature from the College of Saint Benedict and Saint John’s University in Minnesota. Hudda is the founder and president of Filsan Consultant LLC. Filsan works with local businesses and related entities to provide three revenue-generating services: consulting, speaking engagements, and training for the employer. Hudda is a change agent, providing necessary resources to bring the central Minnesota community and new American populations together. In doing so, businesses and community members can learn about each other and leverage their cultural backgrounds in innovative ways to create successful business relationships. On weekends, Hudda mentors a cohort of young Somali women. She has strived to be known as an engaging and effective advocate for the educational and social needs of students and adults throughout an increasingly large and diverse community. In her spare time, she reads books and magazines. In recognition of her leadership, Hudda has received numerous awards. These include the 5 under 40 Award, 2016 Difference Maker ,2017 Difference Maker, 2016 Partners in Education District 742 Award for the Take Ten project, and the Women’s Group project. The Somali American National Institute has offered her an appreciation award for her work in the community. St. Cloud Mayor David Kleis presented Hudda St. Cloud “Rock On” Award. A: Before I wrote this book, I spoke at schools, churches, and businesses about Somali people’s life experiences, challenges, and opportunities. The idea of writing this book came to me after several of my close friends and colleagues asked me questions about Somali people and their culture. Many have wondered how thousands of Somali refugees, who have a unique culture and little knowledge of English, came to live in this cold, snowy area with people of predominantly European descent. I hear every day many Saint Cloud–born Americans ask who these new people are. What are their lives and struggles like in Saint Cloud? Are they contributing to the Saint Cloud economy or draining resources from the community? Are they assimilating or trying to impose their culture and religion on American mainstream society? A: For almost one year and half. A: Depending on what kind of research you want to conduct. For this book, “From Somalia to Snow,” I interviewed thirty-four Somali members of the Saint Cloud community. I collected these interviews and took notes for over one year. A: I am currently working on two more books. I also am finalizing my thesis as a book. A: When I was seven, I started writing my daily journal. My advice to you is write story. Write a journal. Write as much as you can. Keep going. Don’t be afraid to fail. You will always have a room to correct your mistakes by yourself. Do all you can to make the story you’re telling so fascinating to yourself that you can’t imagine putting it down. Q: Is there anything you find particularly challenging in your writing? What was the hardest part of writing this book? A: Yes, many Somali community members initially were hesitant to talk to me about their experiences. To remain as open as possible, I chose not to ask them predetermined questions, so we shared informal conversational interview. When I talked to them about my own experiences and challenges, they started to be so open to me. I learned that not everyone liked the idea of “question and answer.” People don’t feel receptive to the idea of talking about immigration and assimilation, mental illness and physical abuse. I found most people might mistake the assimilation with integration because these two terms are not in our Somali language. Instead, we use other terms comparable to them. Another problem I met was some interviewees felt uncomfortable at public places. Some invited me to their own homes. Q: Do you have any unusual writing habits? A: Yes, I have some unusual writing habits. I have some quirky habits and rituals that will work for me while writing or researching. To find motivation for my writing, I drink several cups of coffee. Good ideas pop into my head while I am trying to taking shower or falling asleep. I stop all I am doing, jot down my thoughts on paper before they disappear. Sometimes best ideas come to me in the car. All I do is record it on my phone. A: Any place where I can smell coffee is nice place to write. A: Every chapter is my favorite chapter to read. I really don’t have a preference. I still read each chapter religiously. Q: Do you have any advice for future authors? A: Once an English novelist, Will Self, said, I quote, “The writing life is essentially one of solitary confinement – if you can’t deal with this you don’t need to apply.” Unquote. There will be a time you will love being alone with your laptop. Anyways, write a first draft. Do not worry about mistakes and typos. Just write all you can first. It is a powerful feeling when you start writing a story. Many people think about book publication before they even start writing. A lot of your close friends will tell you writing is not that easy or did not work for them. Never assume your writing will not work for you as well. I think the rule of writing is that if you do it with enough self-confidence. Always stay motivated while writing. Trust me, once you start writing, you will face doubt. The best way to overcome such self-doubt is get to know what you want to write in advance. Write something different. Write something you are good at and write something you know well. Rely on your ability and tell yourself you can write well, then do all you can to prove your ability to write. You will always have someone who will support you along the way. A: I honestly cannot thank Beaver’s Pond Press enough for their hard work and dedication to my project. The support and guidance I received encouraged me to publish this book. A: Currently, I have four unpublished manuscripts and one half-finished book. A: I love you all. At a time when United States citizens are being told to fear their Muslim neighbors, where does the truth lie? In this powerful book, Hudda Ibrahim unpacks the immigration narrative of Somali Americans and explains why nearly 20 percent have chosen to settle in Minnesota. From Somalia to Snow gives readers an invaluable insider’s look into the lives and culture of our Somali neighbors and the important challenges they face. Designed with a diverse audience in mind, this book is a must-read for students, health-care professionals, business owners, social service agencies, and anyone who wants to better understand Somali people in Minnesota. Why thousands of Somali refugees came to live in this cold, snowy area with people of predominantly European descent. Answers to questions like, are Somali Americans contributing to the economy or draining resources from the community? Are they assimilating or trying to impose their culture and religion on American mainstream society? ORDER "From Somalia to Snow"
Wednesday, October 11th, 2017 at St. Cloud Bethlehem Lutheran Church at 6p.m.-8:00p.m. Tuesday, October 10th, 2017 at Whitney Recreation Center, St. Cloud, MN at 9:30a.m.-12:30p.m. College of Saint Benedict at 4:30p.m. County Road 120, Sartell, MN. “From Somalia to Snow: How Central Minnesota Became Home to Somalis provides a great understanding of Somali culture, tradition, religion, and issues of integration and assimilation. In addition, it enhances awareness of the challenges and barriers that the Somali community faces. The book sheds light on the hopes, dreams, and aspirations of the Somali people. The Somali experience is similar to the experiences of other immigrant and refugee groups. They, too, want to live the American Dream. I highly recommend this book to educational institutions, the business community, health-care departments, and anyone who works and continues to build for community. 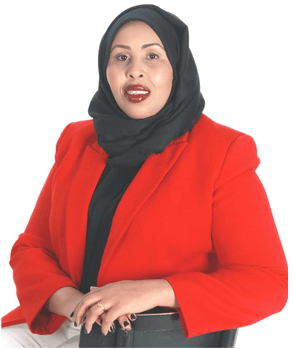 “Hudda Ibrahim has long served as an economic adviser to our greater Saint Cloud community, to Somali and greater Saint Cloud–area businesses, and to our foreign-born residents. And now, this talented, passionate young woman has gifted our community with her much-needed and long-awaited publication filled with personal and professional insights on the journey and challenges faced by Somali immigrants and refugees that have joined our community. 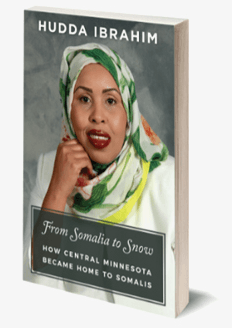 Thank you, Hudda, for pouring your heart and soul into writing this book, From Somalia to Snow: How Central Minnesota Became Home to Somalis, and for being a trailblazer, a role model, and a community leader. But most of all, thank you for being a very dear friend. 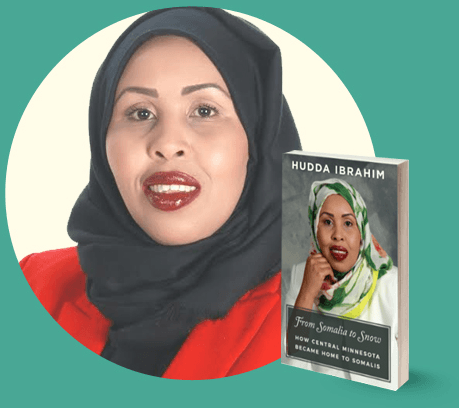 “Hudda Ibrahim’s book is a must-read because it is well researched, informative, holistic, and one of the best introductions to Somali culture for people of central Minnesota and beyond. Hudda writes with clarity, honesty, and integrity. Her very timely book is a valuable resource for the local community, for it strikes a wonderful balance between personal and professional narratives that capture critical information of her native cultural heritage. To find out about Hudda's publisher, Beaver's Pond Press, click here. Please email me and tell me what you thought of the book you read! The letters come right to me, and I always answer.